In 2011, the Joe Andruzzi Foundation had two very passionate members of “Team JAF” who ran the John Hancock Boston Marathon® in support of cancer patients in need of financial assistance. Together, Tim Weeks and Stephanie Riley collectively raised over $9,600 for our Foundation, but most importantly, they paved the way for our involvement in the Boston Marathon, and recorded the first strides for what would blossom into a family of Team JAF rock stars over the years to come. It’s hard to believe Team JAF’s first Marathon was almost five years ago. Since that race, more than 100 special runners have pledged to train and fundraise as a member of our Marathon team, becoming the ultimate foundation ambassadors along the way. In that time, Team JAF’s fundraising has totaled more than $950,000 over five Marathon Monday’s, and with your help, our 2016 team will cross (and go well beyond) the $1 million mark. That mean’s our runners will have raised enough funds over six Boston Marathons to empower JAF to assist more than 1,500 cancer patients in need. Pick any single Patient Profile up on our website, read and digest how these funds help alleviate cancer’s financial and emotional burdens for our patients, and then multiply that impact by 1,500! We are truly inspired and forever grateful for what our Boston Marathon runners have been able to accomplish. 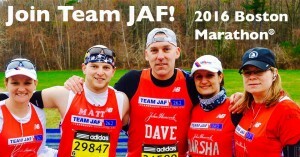 JAF for the 2016 Boston Marathon! Team JAF has once again been selected to participate in the 2016 John Hancock Non-Profit Marathon Program, and on April 18, 2016 – Marathon Monday – we want YOU to be donning JAF’s colors as you cross the finish line. Team JAF welcomes new applications from those seeking a charity bib, as well as any runners anticipating to receive entries through qualification or outside invitations. Those seeking charity bibs are required to raise a minimum of $7,500 for the Foundation, while qualified andinvitational runners must pledge to exceed $1,500 in order to be a member of Team JAF. We’re excited to have Susan Hurley of CharityTeams reprising her role as Team JAF’s captain, and will be available to all of our runners for her expert training and fundraising assistance! We are also proud to announce that three former Team JAF Boston Marathon alumni runners will be back with us for 2016 – including Amy Pepe, Matt Bernie, and John Ponte. Collectively, these three raised more than $30,000 for JAF through the 2015 Marathon, and we’re thrilled to have them back for an encore! As always, fundraising by Team JAF runners directly supports the Foundation’s mission of providing help, hope, and a reason to smile for cancer patients and their families. Team JAF runners are also encouraged to spread our (Up)Beat philosophy as they fundraise and compete, showing how a positive attitude can conquer any hurdle.